Ruth & Gary Fuller welcomes you to Fullers Ark, as a pet carers we will look after your pet as if it is our own. If we go away, Our dog is most happy left in her own home and she is always very pleased to see us and very happy when we come home. Please feel free to have a look at our site and see what we can offer you, and feel free to contact us if you have a query. Also if we board a small animal you can feel free to come and view where they will stay. 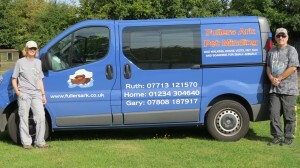 We are open all year round, if we are away we have reliable and trustworthy people covering for us. Hope to see you soon, Ruth & Gary Fuller if you cant get us at home please leave a message or try our mobile, also I always have access to e mail on my mobile. If a regular dog walk needs to cancel a walk, we need to know before 830am on the day as we normally have a very tight schedule ,after 830am we have to charge for that day, if you need to cancel a holiday booking on the day there is a 50% charge the day before a 10% charge as we might have turned another customer down ,the holiday cancelation is to our discretion. Fullers Ark provides a first class service, I can rely on them 100% they provide my cat with all the care she needs and gives me total piece of mind I couldn’t do my job without them;I recommend them to anyone who wants their pets cared for at the highest level.